Prominent rabbi of Cordova, 950-1024. His father was one of the four scholars who, according to tradition, were taken prisoners while on a voyage and sold as slaves, and who subsequently became the founders of Talmudic schools in their new homes (see Apulia). Enoch, then a child, was with his parents. When R. Moses achieved honor in Spain and was made rabbi of Cordova, young Enoch found for a time in brilliantexternal conditions compensation for the sorrows of his childhood. He married into one of the most noble and prominent families in Cordova, and succeeded his father as rabbi. Though made wealthy through these connections, Enoch always led an ascetic life, depriving himself for the benefit of the poor and needy. After the death of Prince Ḥasdai ibn Shaprut, his friend and protector, Enoch entered again upon a period of adversity. A party arose to dispute his authority and position in favor of Joseph ibn Abitur. 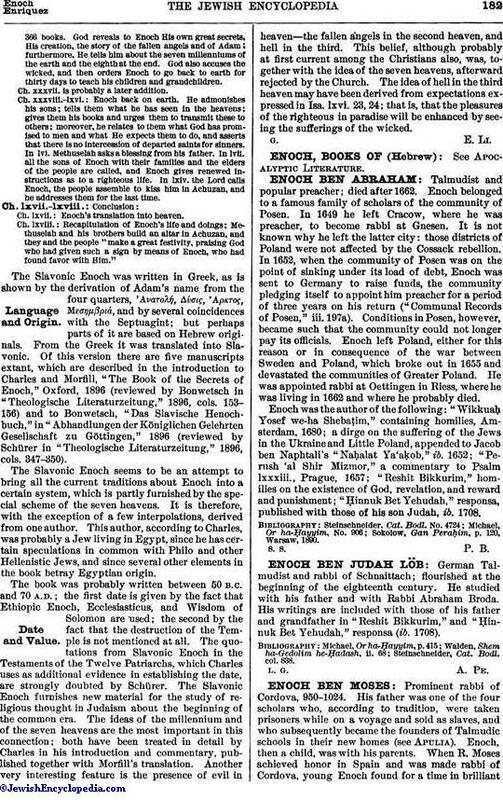 Enoch prevailed, and Ibn Abitur sought protection in foreign countries. Two of Abitur's followers, the brothers Jacob and Joseph ibn Gau, rich silk-manufacturers, gaining the favor of the calif by presents of money, were granted the privilege of appointing rabbis at Cordova. Thereupon they deposed Enoch and invited Abitur to return; the latter, however, declined, and died in exile. 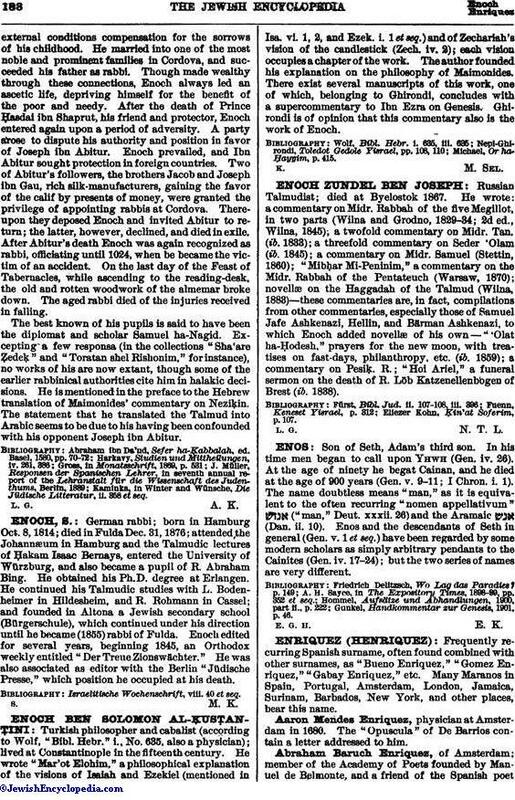 After Abitur's death Enoch was again recognized as rabbi, officiating until 1024, when be became the victim of an accident. On the last day of the Feast of Tabernacles, while ascending to the reading-desk, the old and rotten woodwork of the almemar broke down. The aged rabbi died of the injuries received in falling. The best known of his pupils is said to have been the diplomat and scholar Samuel ha-Nagid. Excepting a few responsa (in the collections "Sha'are Ẓedeḳ" and "Toratan shel Rishonim," for instance), no works of his are now extant, though some of the earlier rabbinical authorities cite him in halakic decisions. He is mentioned in the preface to the Hebrew translation of Maimonides' commentary on Neziḳin. The statement that he translated the Talmud into Arabic seems to be due to his having been confounded with his opponent Joseph ibn Abitur. Kaminka, in Winter and Wünsche, Die Jüdische Litteratur, ii. 358 et seq.